Starting today, the Clog is beginning a Summer Bucket List Series, where we’ll suggest some of the hippest, chilliest, coolest, swaggiest, Cloggiest, you-don’t-want-to-miss-these things to do this summer. Let the fun times begin! 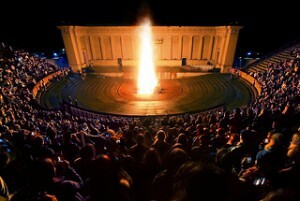 First up on our list: see a concert at the Greek Theater! We’re sure you’ve heard plenty of people spiel about how great the Greek Theater is — it’s fantastic acoustics, old-age architecture, and intimate atmosphere make it one of the best places to watch a show. Heck, even Yelp gave it great reviews! Seeing a show at the Greek Theater is a must before you leave Cal — trust us, it’s far better to be in the venue than outside on the steps of Foothill. Yeah, we know tickets can be expensive, but the experience is worth it; try it at least once, and what better time to do it than this summer? Saturday, June 23: The Avett Brothers — Beautiful harmonies are such a turn on. We can imagine that listening to these guys with certain libations in our system would be such a trip. And the best part? The ticket price for this trio ($42 for general admissions) is really cheap compared to some of the other shows. Friday, June 29: Foster the People — The Clog will admit that we’re not too familiar with this L.A. based band besides their smash hit, “Pumped Up Kicks” and the hilarious Zac Efron and Taylor Swift cover of it. We’re still a little disturbed by the lyrics, and all we can say, upon reviewing a youtube video of one of their concerts, is that the sick electronic feel is completely revamped live. Headaches ensue. Saturday, July 14: The String Cheese Incident — As mentioned before, we aren’t exactly connoisseurs when it comes to the indie music scene. But hey, we’re willing to try out any band whose name has both “string cheese” and “incident” in it. We can only wonder what must have occurred for the two to have been combined. Sunday, August 12: Dead Can Dance — This one here’s right after summer session finals end and right before the fall semester begins. We plan on raging the night of Friday, August 10 and Saturday, August 11. Got nothing planned for Sunday though? Well apparently this show will be a part of DCD’s “World Tour”. Another excuse to go hard before Fall 2012 picks up. Whatever musical offering you choose to partake in, remember to get your tickets fast because the Greek Theater is ridiculously popular. Sit back, relax, and let the waves of music wash over you. No more of that Foothill cop-out you’ve been free-riding on for so long. Now is the time to watch a concert — live. Any suggestions as to what should be included in our summer bucket list? Feel free to comment below, or email us at [email protected]! Got tickets with seven other friends for Foster the People. Lynn, you should get a ticket and go. They were really good at Lollapalooza last summer.